Flame retardants are added to products to slow or prevent the growth of a fire. Many of the items in your house likely contain flame retardants, including mattresses, curtains, and carpets. Flame retardants are also used in vehicle seats and bumpers and building materials such as electrical wires. Figure 1. Common places flame retardants are found. Image Credit Top: freestockphotos.biz. Image Credit Bottom: pixabay. Polybrominated diphenyl ethers (PBDEs) have been the primary flame retardants used industrially and commercially worldwide. Scientists have identified PBDEs as persistent organic pollutants. A persistent organic pollutant is a chemical that does not degrade naturally in the environment. Therefore, it can remain in the environment for a long time. As a result, Europe and North America have started to phase-out the use of PBDEs and switched to using alternative flame-retardant chemicals. Unfortunately, these alternative flame retardants have similar properties that make them persist in the environment as well. In fact, alternative flame retardants have already been found in house dust, air, wastewater, sediment, and wildlife. Flame retardants have even been found in the oceans. One concern is that marine organisms may accumulate flame retardants acquired from their diet in tissue. The flame retardants may then be transferred to their offspring, a process known as maternal transfer. Previous studies have determined that original flame retardants (PBDEs) did undergo maternal transfer in mammals and elasmobranchs (sharks, rays, and skates) with live bearing reproduction. This could lead to problems in the offspring including immune disruption, endocrine disruption, and developmental neurotoxicity. Hillary Marler and her colleges wanted to determine if maternal transfer of both PBDEs and new alternative flame retardants occurred in selected shark species from the Atlantic Ocean. They also wanted to see if the chemical properties of the retardants influence maternal transfer. Hillary Marler and her team collected pregnant sharks from five species (blacknose, blacktip, bonnethead, Atlantic sharpnose and spinner) in offshore waters form South Carolina to Florida (Figure 2-6). Once the sharks were captured, the team collected liver tissues from the mothers and their embryos. Then, the researchers took the liver samples back to the lab and measured the amount of 35 non-PBDE flame retardants and 20 PBDE flame retardants in the tissue. Figure 2. Blacknose shark (Carcharhinus acronotus). Image Credit: NOAA, Wikimedia Commons. Figure 3. Blacktip shark (Carcharhinus melanopterus). Image Credit: Wikimedia Commons. Figure 4. Bonnethead Shark (Sphyrna tiburo). Image Credit: Yinan Chen, Wikimedia Commons. Figure 5. 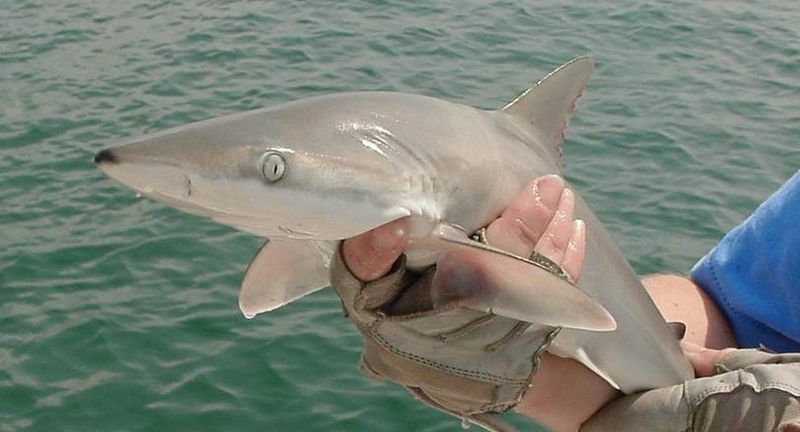 Atlantic sharpnose shark (Rhizoprionodon terraenovae). Image Credit: NMFS, E. Hoffmayer, S. Iglesias and R. McAuley, Wikimedia Commons. Figure 6. Spinner shark (Carcharhinus brevipinna). Image Credit: Dieno, Wikimedia Commons. The researchers found that PBDEs were the most abundant type of flame retardants in adult female sharks. The scientists also found alternative flame retardants in the mother liver samples, but they were at concentrations 10 to 100 times lower than PBDEs. Unfortunately, the scientists found that maternal transfer did occur in the sharks. However, the amount of transfer varied within and between species. Differences in maternal transfer between species could be due to differences in age at maturity, reproductive strategy and female feeding strategy. For example, litter size differs between the species. Spinner sharks give birth to litters of 3-20 pups while blacknose sharks give birth to 1-6 pups. More pups result in the contaminants being spread out, meaning there is a lower amount of contaminants in each embryo. Maternal transfer was significantly influenced by the chemical properties of the flame retardant. Flame retardants that do not dissolve in fats have decreased mobility, uptake, and bioaccumulation, reducing maternal transfer. We now know maternal transfer is occurring in sharks in the Atlantic Ocean which may pose risk to embryonic development. However, we do not know the toxic threshold of flame retardants for sharks. This will need to be the focus of future studies. Sharks are at the top of the food chain in the ocean and play an important role in maintaining a balanced ecosystem. Therefore, it is important to determine if flame retardants will impact the health of shark populations.